Rhonda Sherman, Horticultural Science Extension Specialist, traveled to Guyana South America through the sponsorship of Partners of the Americas and the Farmer to Farmer Program participating in the Guyana Horticulture Project from March 2 – 16, 2013 Guyana Times article. 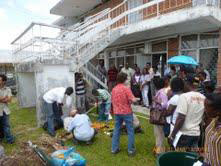 During her 2-week trip, she led training workshops in composting and vermicomposting at St. Stanislaus College Farm in Georgetown, and at the National Agricultural Research Institute. Training topics included: compost mixing and pile formation; curing, storage & handling; bagging; and recovering un-composted material from finished compost. 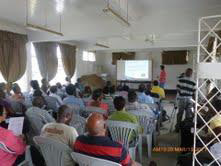 Training attendees – current vegetable producers, students, and other members of the public – gained knowledge in composting and vermicomposting techniques and will be better able to manage farm and home-based composting systems. Rhonda also led a similar training program in the Dominican Republic in September 2012.
practitioners from the U.S. and the Caribbean. Volunteers from the U.S. work with farmers and agribusiness owners in Guyana, Haiti, Nicaragua and the Dominican Republic to identify local needs and design projects to address them.